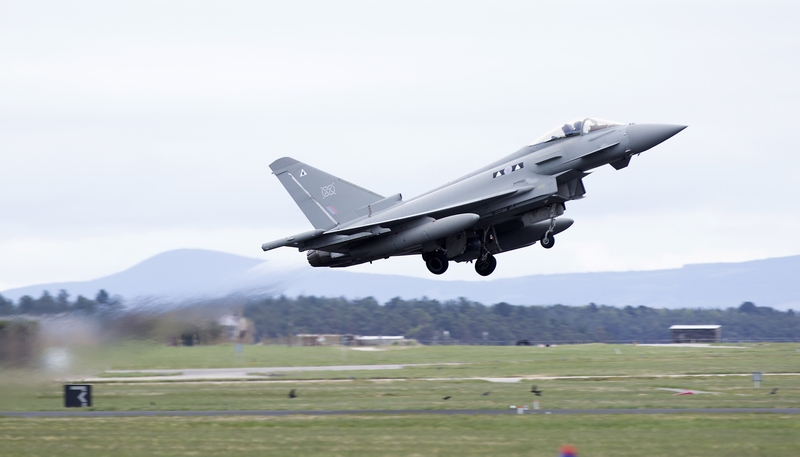 January saw a late Christmas present for II (Army Cooperation) Squadron based at RAF Lossiemouth. The completion of their brand new Squadron HQ allowed them to move out of their temporary old Cold War facilities, previously used by 617 Squadron (the Dam Busters) and into completely new purpose-built accommodation. I am Jim Ellistone, a Civil Engineer working for DIO Programme and Projects Delivery, but have been supporting the DIO Service Delivery Total Facilities Management team by taking the role of Project Manager of this £23m project. It includes a new Squadron HQ building, nine refurbished Cold War Hardened Aircraft Shelters (HAS), outdoor parking for eight aircraft complete with floodlighting and a fully renovated ‘Feeder’ - an industrial kitchen and canteen to feed the 170-strong squadron. I am proud to say this has been delivered early and significantly under budget. 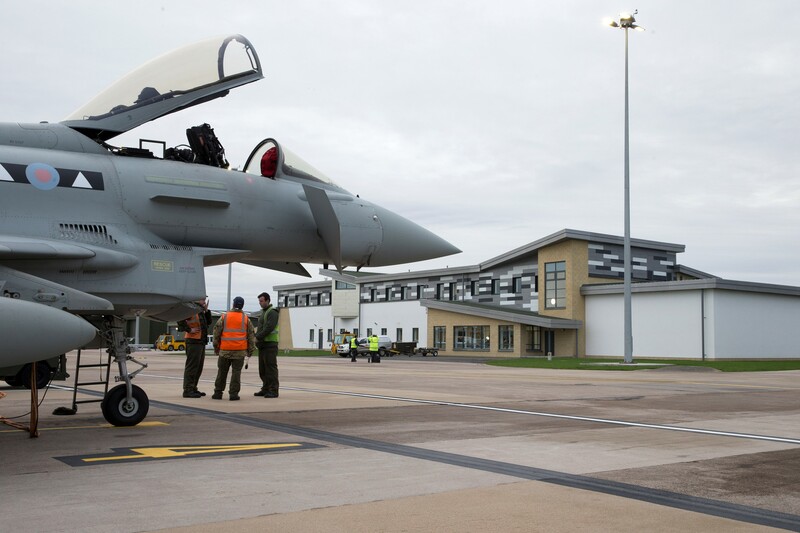 As you would expect the new HQ building provides all the high-tech, secure planning and briefing facilities required to plan and execute complex missions with other Royal Air Force squadrons and our NATO allies. However, it also houses the Squadron’s engineering and survival equipment facilities. The engineering area includes storage for aircraft and ground equipment spares, tool kits and office space for the personnel who maintain the aircraft. The survival equipment section maintains all the equipment worn by the pilots when flying including G-suits, life jackets, flying helmets and night vision goggles. Finally, the building contains all the Squadron’s executive and administrative offices along with ‘life support’ facilities, such as locker and shower rooms, and the all-important tea-making facilities required to sustain the 170 squadron personnel regardless of the efforts of the Scottish winter. The pilots of II (Army Cooperation) Squadron fly the Typhoon, and the squadron has two primary tasks. The first is to contribute to the air defence of the UK. This involves holding the Quick Reaction Alert (North) role which means that if required, they are scrambled to intercept foreign aircraft such as Russian Bears and Backfires operating just to the North or West of UK airspace. The squadron also has to be ready to deploy on global operations at short notice. Surprisingly there is not a standard RAF squadron design and even squadron using the same aircraft will want to operate slightly differently. As a result it was vitally important that the design and construction team fully understood the requirements of the Squadron’s tasks to be able to deliver them the right design. We made the time and with help from the squadron we believe we got the design as near right as humanly possible. The success or otherwise was always going to be a team game. It relied on close co-operation from all the parties: the Station; the squadron; DIO; the designers; the contractors, Turners, Balfour Beatty, Watson Burnett Architects and SPIE UK; as less than 35% of design was completed when the contract was signed. This type of direct contract is a challenge but was the only one available that could deliver to the very tight time line required by the RAF so we went for it. If the team does not pull together as Project Manager you would find yourself trying to herd a group of cats and heading for disaster. We started on site in October 2014 and have completed the project in 14 months, which included most of the design. We delivered the major refurbishment elements seven months early to allow the squadron to operate independently and completed the main build three weeks early. The project as a whole is significantly under budget; by any standards this in-house Service Delivery Project has been a superb team effort fully supported at every stage by the RAF. The squadron has said they are delighted with the result which is the highly positive outcome the construction team always hoped to achieve. Sustainability has been a key driver and the project has achieved the highest sustainability MoD standard of ‘DREAM Excellent’. It is highly energy efficient, built to be robust for long-term low cost use and has climate change resilience built in. It also has been built on the site of an old Second World War hangar. We first utilised part of the old concrete hangar slab for the contractor’s compound and finally as the permanent bases for the car park and the firefighters’ water tanks and pumps. The concrete hangar slab was in as good a condition as when it was first poured in 1939, when many airfields were rapidly constructed to provide bases for aircraft preparing to defend these islands. Apart from the significant cost and energy savings realised through re-use of the slab, it also seemed appropriate that a structure which has literally underpinned RAF efforts through both ‘hot’ and ‘cold’ wars for almost 80 years will continue to support the RAF well into the 21st Century.